Just with all bucket list experiences, once the idea gets under your skin then it’s never going away until after a darn good scratch and if you feel the need to allow your body to fall from 400 metres up before being catapulted back into the air then read on as bungy jumping in New Zealand is definitely for you. Of course, if you want to do things right then you’ve got to head to the site of the original, first-ever jump and that’s Kawarau Bridge in Queenstown. This was where the madness began some 25 years ago when Alan John Hackett (AJ to his mates) pioneered the commercial element of what was to become one of the world’s greatest ever extreme pastimes. Queenstown is regarded as New Zealand’s premier adventure activity city and a major ski and snowboard resort during the winter season. This is yet another awesome reason to bungy in NZ as there’s such a wide range of things to do once you bounce back down to earth. White-water-rafting, mountain biking and paragliding are just three of a vast array of outdoor sports and thanks to some of the best scenery on the South Island you’ll never be stuck for wide open spaces. The Remarkables Mountains, Lake Wakatipu and the Kawarau River are all superb if you’re into your landscapes and if you fancy a cheeky glass of Pinot Noir while the sun sets then you won’t be disappointed as this is the heart of the Gibbston Valley where you’ll find some of the best vineyards in the whole of the Central Otago region. Anyway, back to the reason that brought you to this gorgeous part of the world in the first place and if you’re thinking that this particular little itch is becoming that little bit more annoying then you obviously need to do something about it and quick. After all where are you going to get a screen saver of you, upside down, with your head being dipped into the deep blue waters of the Kawarau River? How about a fully blown-up version framed and hanging above your bed just to prove to yourself that you did it? Talk about motivation to get out into the world full of belief. One look at a photo of you bungy jumping every morning will no doubt be all the boost that you need to start your day without even thinking about caffeine. That’s what bungy jumping is all about, the experience and just like any feat of courage and strength, once you’ve accomplished your first jump you’ll feel ready and able to take on the world. 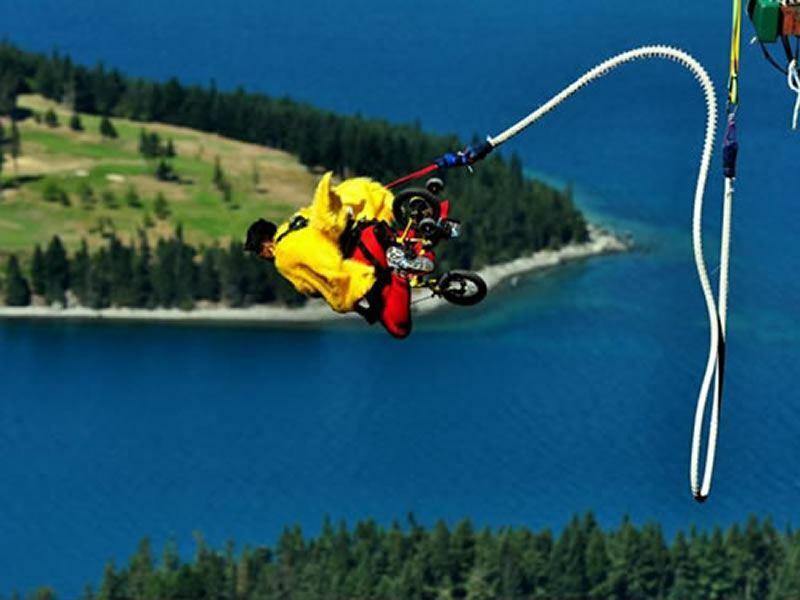 There simply aren’t any other sports like this to get your adrenaline flowing so freely and with such energy and if you’re thinking about looking life and death clear in the eye whilst laughing or screaming then you’ve certainly got to get over to New Zealand and make your bucket list dreams become reality. Of course, if you don’t fancy undertaking such an experience on your own or you just really love to share, then the bungy jump over the Kawarau River is the only place in Queenstown where you can go tandem. Jumping with a mate is the perfect way to (quite literally) bond and if you’re looking for the ideal means of cementing your relationship or celebrate a moment away from home then there aren’t many better opportunities. Alternatives to the original jump off the Kawarau Bridge include the Ledge and the Nevis both of which give you more options to take extreme to new levels as if simply jumping head first from over 1,000ft wasn’t enough. This involves you running, walking or crawling over a short platform prior to jumping off to face the views of Queenstown from an entirely new perspective. You’ll be actively encouraged to spring, twist and flip just to enhance your adrenaline levels and if that wasn’t enough there’s a chance to undertake this incredible experience at night with the twinkling lights of Queenstown far, far, below. Again, this is for anyone that feels that a straight-forward bungy jump just needs that little bit extra element of extreme. Also operating at night and really not for the feint-hearted the Sky Swing does exactly as you’d expect and as you fall, fall, fall down, down, down your flight path will suddenly morph from descent to swing when you very least expect it. Standing at almost 15,000 feet above Queenstown, the Nevis bungy is pretty much as legally high as you’re going to get in New Zealand and with an estimated free fall of just under nine seconds this is the ultimate in high-octane action. So called because it’s located in the remote Nevis Valley (to the south of Lake Wakatipu) there’s as much fun getting to the high altitude bungy pod as there is jumping off and those with a fear of heights really need not apply. Outside of Queenstown there are numerous other spots to bungy in New Zealand and if you’re heading over to North Island then Auckland certainly ticks all of the death-defying boxes and then some. Jumping off the Auckland Harbour Bridge is definitely something you’ll want to tell the grandkids about and as this experience also incorporates a pretty cool climb up to the top of the steel structure you’ll be treated to some amazing views prior to undertaking the jump of a lifetime. Wherever you find yourself in New Zealand, one thing is for sure, complementing your trip with a bungy jump is just an awesome excuse to remember your travels for all time. Bucket list ticks are all about conquering fears, enjoying life to the max and trying something that you certainly wouldn’t do every day and bungy jumping in New Zealand is just one of those ‘once in a lifetime’ itches that need to be scratched sooner rather than later.